Russula atropurpurea is quite a large mushroom and very common. 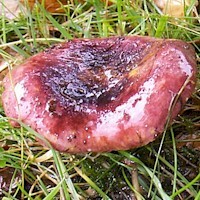 The centre is almost black, with a purple region near the rim, which gave it its former common name of Blackish-purple Russula. 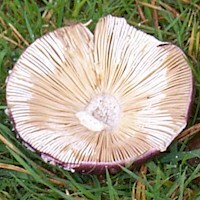 This mushroom is one of the most common brittlegills in Britain and Ireland. 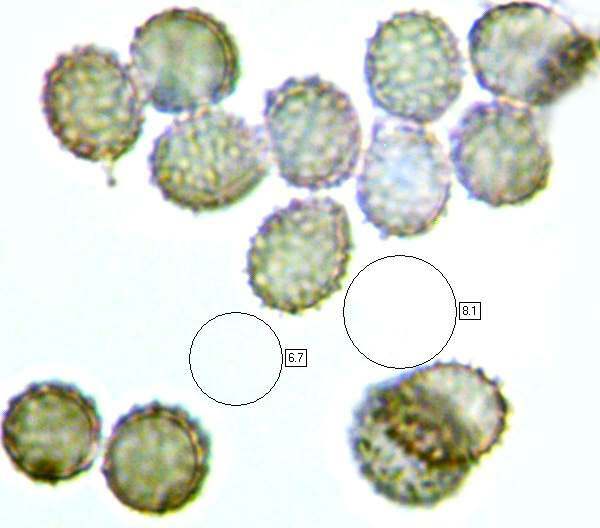 When old, the fruitbodies often fade, especially towards the cap rims, but the centres remain blackish. The mature fruitbodies shown on the left have developed concave caps that collect water during wet weather, and much of the colour has washed off from areas of the cap near to the rim. A common find in woodlands throughout Britain and Ireland, the Purple Brittlegill occurs in most countries of mainland Europe and in other parts of the world including Asia and North America. This brittlegill was described in 1845 by German mycologist Julius Vincenz von Krombholz (1782 - 1843), who called it Agaricus atropurpureus. (Most gilled mushrooms were initially included initially in the genus Agaricus, whose contents have since been largely spread across several newer genera.) In 1893 this species was transferred to the Russula genus by another German mycologist, Max Britzelmayr (1839 – 1909). 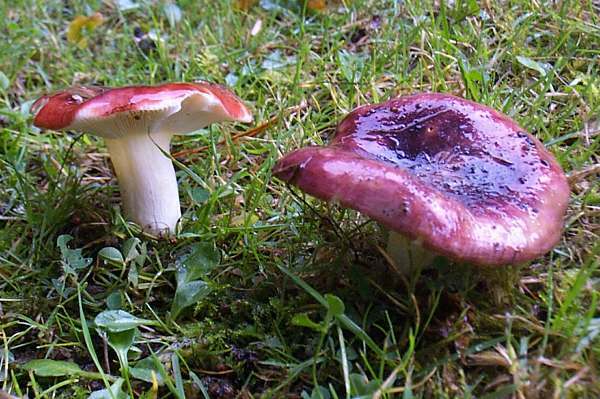 Synonyms of Russula atropurpurea include Agaricus atropurpureus Krombh., Russula undulata Velen., Russula depallens var. atropurpurea (Krombh.) 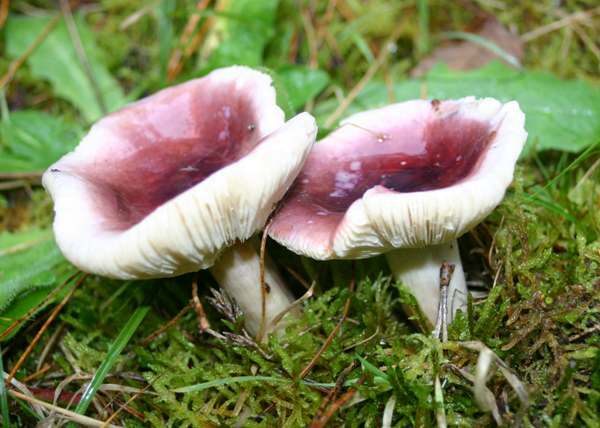 Melzer & Zvára, Russula atropurpurea var. krombholzii Singer, and Russula krombholzii Shaffer. Russula, the generic name, means red or reddish, and indeed many of the brittlegills have red caps (but many more are not, and some of those that are usually red can also occur in other colours!). The specific epithet atropurpurea is made up of the prefix atro-, which means black (or blackish), and purpurea, which of course means purple. The old common name Blackish-purple Russula might as well have been superceded by Blackish-purple Brittlegill, but I guess that three-word common name was considered to be a hyphen too far. Although they are so often damaged by slugs, occasionally you come across a perfect specimen of this attractive mushroom intact and in its full glory. This is quite a ubiquitous species and particularly common beneath oak trees and pines. 4 to 10cm in diameter, the caps are at first convex, flattening as the fruiting body ages and usually developing slightly depressed centres. Red-purple near the rim, the caps are dark purple and often almost black in the centre. The flesh beneath the cuticle is white and it crumbles easily. Adnate or adnexed, the fairly broad, crowded gills are pale cream, darkening slightly as the fruitbody ages. 10 to 20mm in diameter and 3 to 6cm tall, the smooth, the brittle stems are white at first but become light grey with age. There is no stem ring. 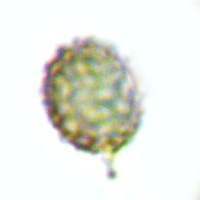 Broadly ellipsoidal to spherical, 7-9 x 6-7µm; ornamented with warts and ridges.. Faint odour of apples; mild or fairly hot taste. Under broad-leaf trees and pines. In common with other members of the Russulaceae, Russula atropurpurea is an ectomycorrhizal mushroom. Russula fragilis, which is quite variable in colour, sometimes mimics the appearance of Russula atropurpurea; it is much smaller, more fragile and its gills have finely-toothed edges. Russula xerampelina, the Crab Russula, has a red-flushed stem and it smells fishy. 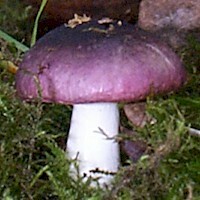 The Purple Brittlegill is an edible mushroom, but it must be thoroughly cooked. As Russula fungi are difficult to identify with accuracy and a small number of species in this genus are known to be toxic toadstools, it is very important to gather for food only those specimens that you can identify to species level with complete certainty. If in doubt, leave it out.